Meet the original Little Bigfoot Bear. He is about 7 inches tall. Date of birth: May 4th 2012 found here. He was reborn August 10th 2017 with this revised pattern given below. The difference is now the bear's head and body are one piece. The rows and some parts were changed slightly. The limbs are now sewn on differently to make it easier for you. 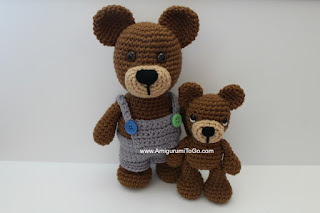 Same tiny bear, better pattern. I've given you patterns for a flat muzzle and a stuffed muzzle. Please note the bear will not stand on its own, I use pins to stand my amigurumis up for photos. 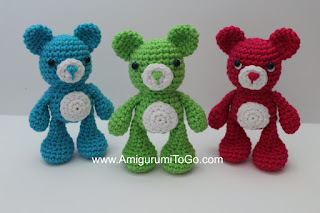 Okay, now let's make the OG LBF Bear! Scroll down this page. Eyes: Feel free to play around with placements. 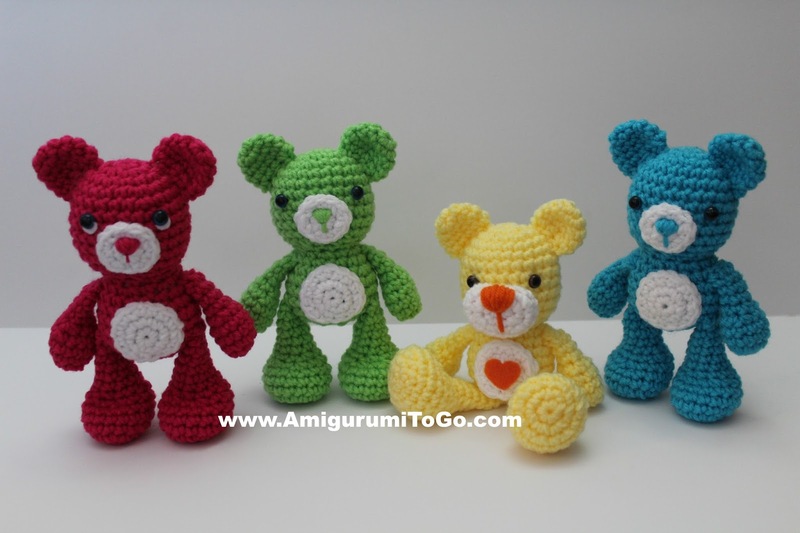 The bears you see pictured have safety eyes in between the 7th and 8th row with 4 to 5 visible stitch holes between them. whip stitch in a nose before sewing to the face. For a small nose as pictured, wrap a few times around row 1, going through the center hole of row 1 each time you wrap. Knot off the yarn tails in the back when you're done. Attaching the muzzle: The top of the muzzle is on or about row 7. Keep your stitches on the inside edge of the muzzle. Bring your yarn needle from the muzzle through the back of the head then back through the inside edge of the muzzle again. Don't pull stitches too tight or it will alter the shape. Sewing on the inside will give you a clean edge around the patch. Pictured below is the muzzle with all the sewing stitches on the inside edge, I did not sew around the outside. See how that gives a nice, clean edge? But if you were to reach under it and pull on the muzzle then it could be pulled off. 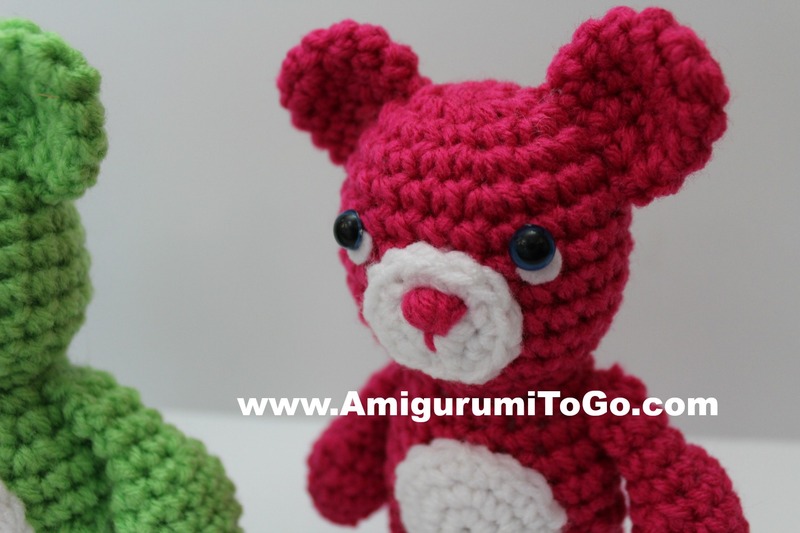 If giving this bear to a small child there are options to make it safer. You could hot glue the middle of the muzzle to the face then sew around the inside edge. Or add holding stitches to the top, bottom and both sides as I did to the tummy patch pictured in the tummy patch section below. The top of the muzzle is on or about row 8 and the bottom on or about row 11. Whip stitch on a nose before stuffing. The brown bear's nose was wrapped around 2 rows and the yellow bear's nose was wrapped around 3 rows. Go through the center hole of row 1 each time you wrap. Wrap as many times as needed to get the desired size. Knot yarn tails inside muzzle when done. Tummy Patch: This is an optional feature. UPDATE: I've posted a whole separate tutorial with ideas for the tummy patch. Click here to view. When you sew this patch to the tummy, keep your stitches on the inside edge of the patch. Sewing on the inside will give you a clean edge around the patch. If you are giving this to a small child then you will want to add extra holding stitches to the patch. Put those as pictured below. Top, bottom and on both sides so that the patch can not be pulled off. Sew gently, don't pull any stitches too tight or you will alter the shape. You could also hot glue the patch then sew around the inside edge. Do not put the hot glue close to the edge of the patch or it could ooze out of the sides and be visible. 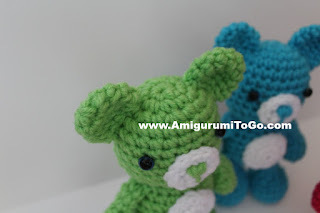 The ears are sewn high and close together. The top corner sewn in between row 2nd and 3rd row and the bottom corner sewn in between the 5th and 6th row. No need to stuff the tail. Sew to the lower, center of the body. And you're done. Please post pictures on my facebook page, Amigurumi Freely, I'd love to see! How come you have just started to hightlight that you don't want Patten copied when b4 you could recreate quite a few of your patterns? that is for those people that take designer's patterns and reprint them on their blogs. I've never allowed that, no designer allows that. It is plagiarism. You can print off the pattern and use it, sell finished objects from the pattern, enjoy the pattern but do not reprint the pattern on your own blog. I've had that highlighted for a long time Before it was highlighted it was still there at the top or bottom of all my patterns.